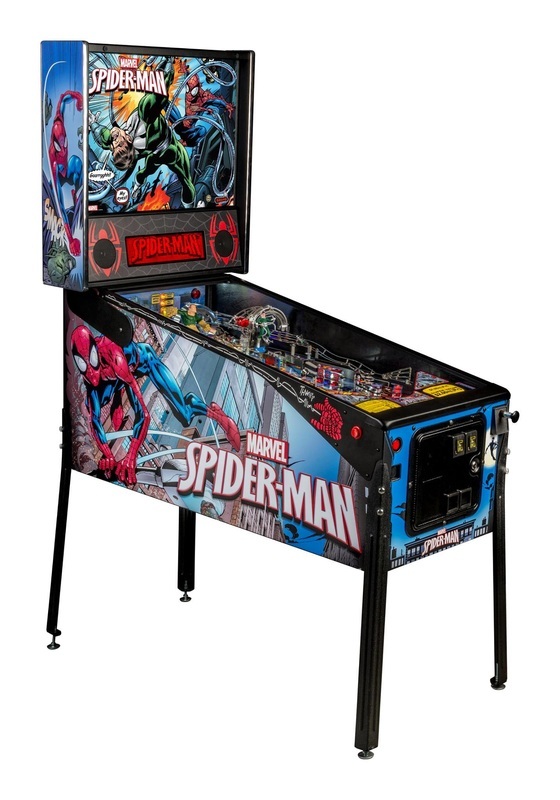 ELK GROVE VILLAGE, IL – January 04, 2016 – Stern Pinball, Inc., the world's oldest and largest producer of arcade-quality pinball machines, announced today the release of its Spider-Man Vault Edition pinball machine. 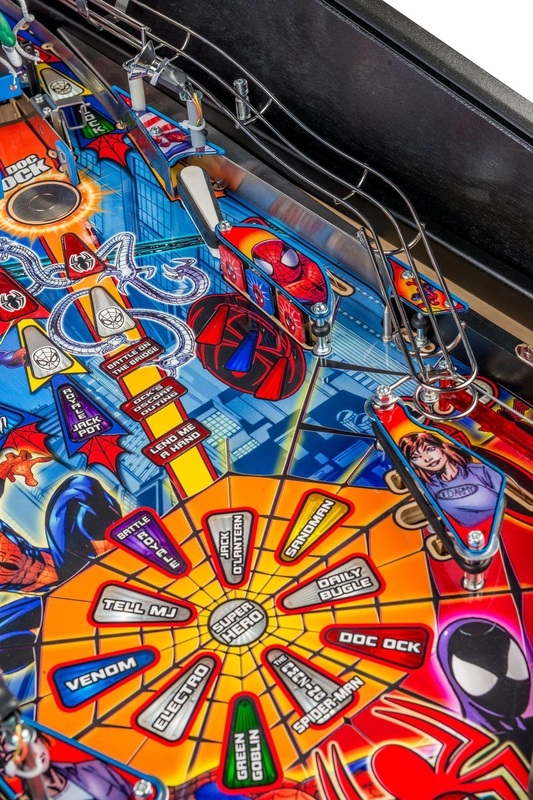 Inspired by the Marvel Universe Comic series, Spider-Man Vault Edition is an update of the pinball classic. The game features all-new art, animation and sound packages based on the legendary Ultimate Spider-Man comic series. 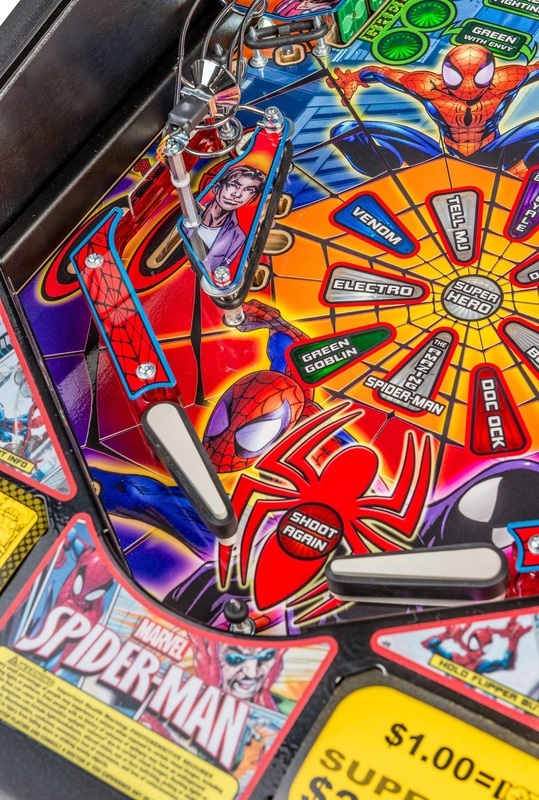 “Spider-Man is one of Marvel’s most popular characters worldwide. 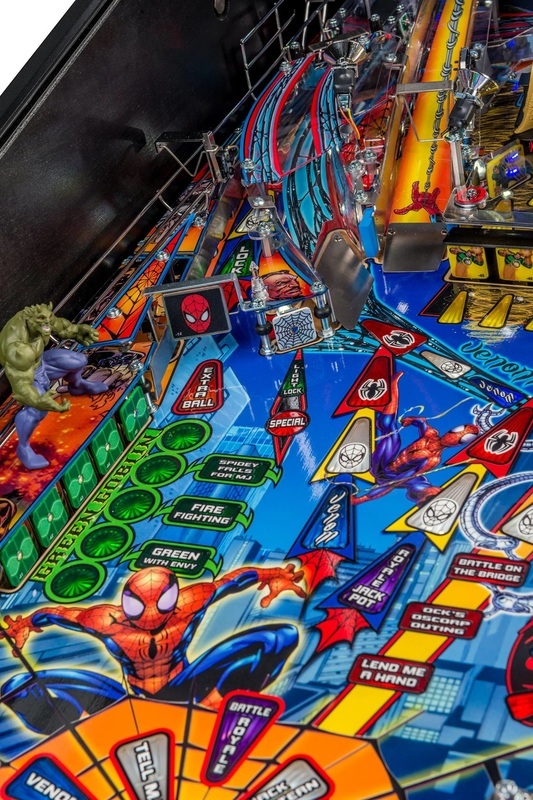 Our goal was to take one of our most popular games and make it even better,” said Gary Stern, Chairman and CEO of Stern Pinball, Inc. “Stern Pinball and Marvel Studios share a love for the characters in the Spider-Man universe and have a long, successful history of collaboration. 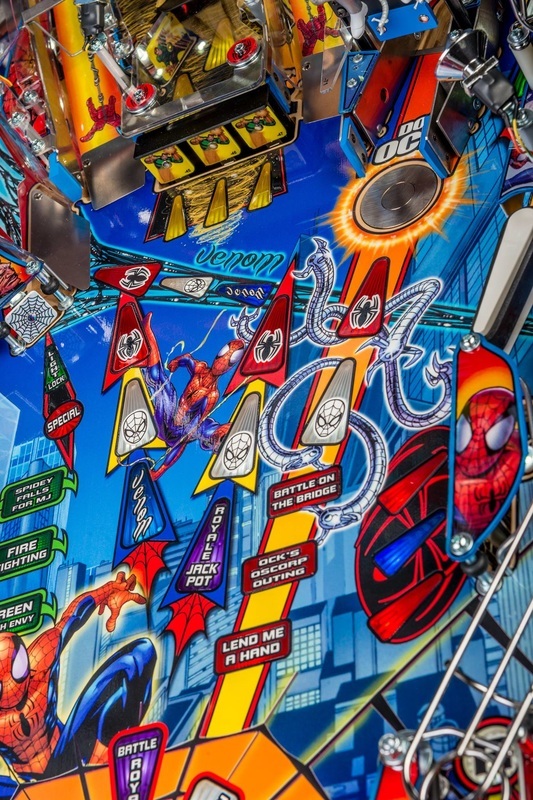 This is a great pinball interpretation of the adventures of Spider-Man”. • The same amazing gameplay of the original, with an all new look and feel. 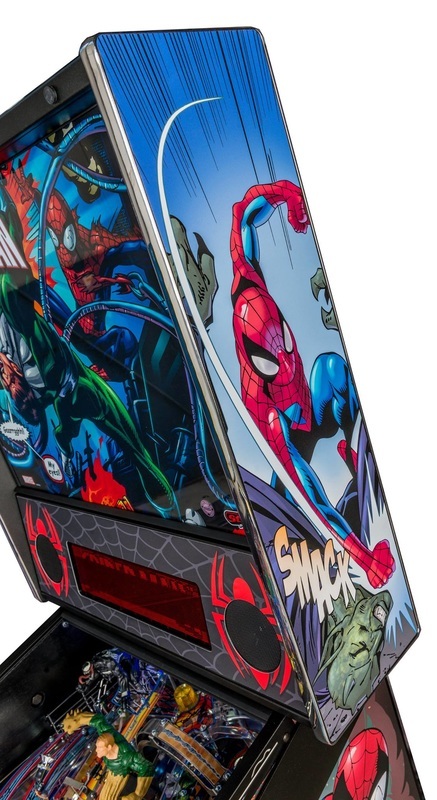 • All new art package, including: cabinet, back glass, decals, and playfield plastics, designed based on images from the actual Marvel Ultimate Spider-Man comics library. 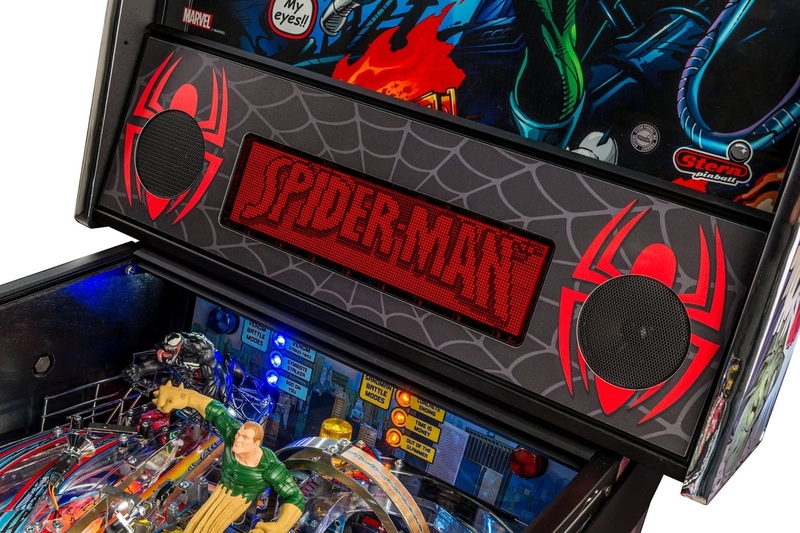 • All new custom-molded toys specifically designed and decorated to capture the Ultimate Spider-Man art style (Doc Ock, Sandman, Venom and Green Goblin). • All new animation and dot matrix video art designed around the Ultimate Spider-Man comic art. • All new custom speech and sound effects for all characters. • New mode event themes based on the Ultimate Spider-Man Universe. • Webslinger themed laser-cut side armor in black powder coat with contrasting color inserts. • Two new music tracks plus the original score. o Steel plastic protectors at the Sandman and in the pop bumper area. 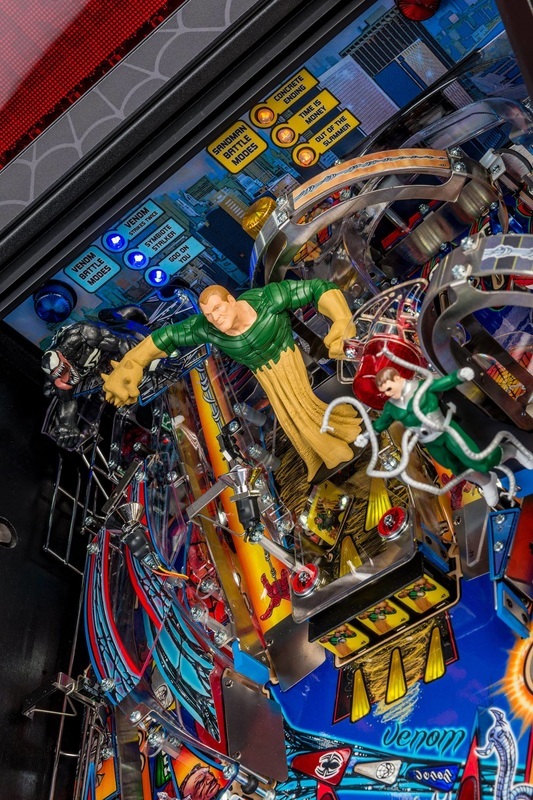 o VUK opening playfield protectors at Doc Ock and the Sandman. 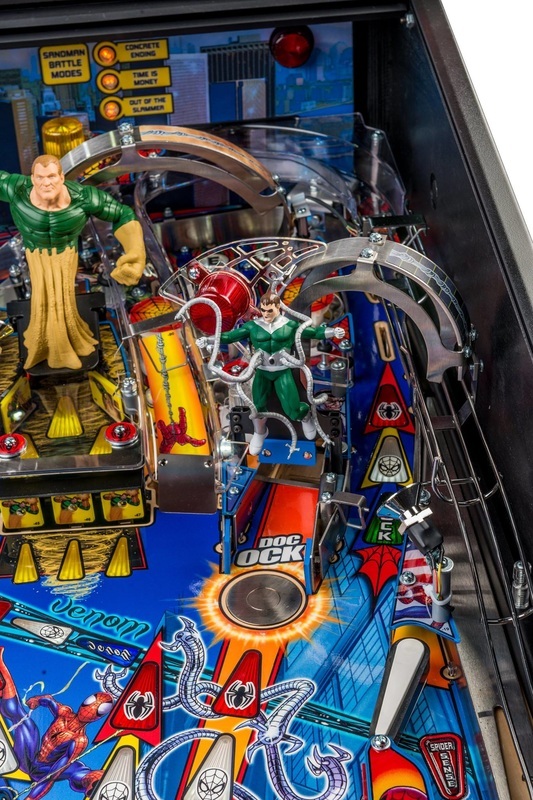 o Stainless steel playfield protector beneath the webslinger in the pops. o All stainless steel webslinger ball guides. o Optimizations to the design of anti-ball trap plastics and ramp covers. o Improved wire form ramp mounting details. o Anti-wear Doc Ock playfield magnet assembly. 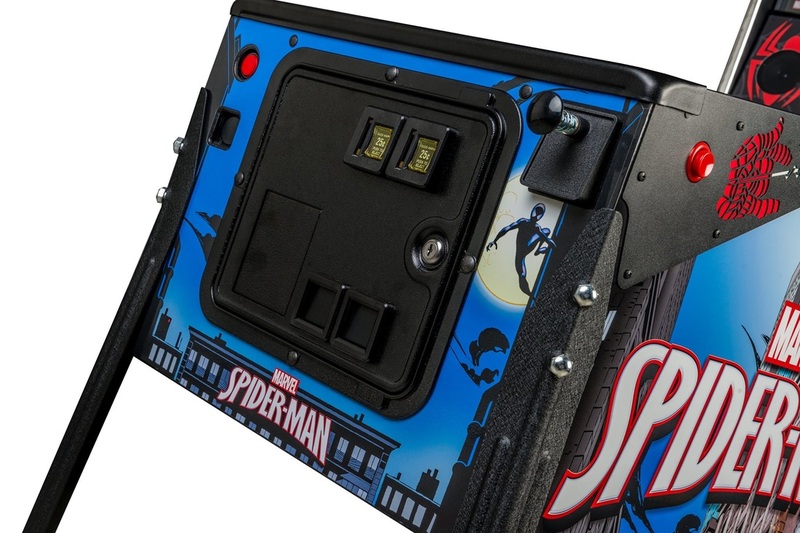 o All LED playfield lighting. The Ultimate Spider-Man is a superhero comic book series published by Marvel Comics from 2000 to 2009. 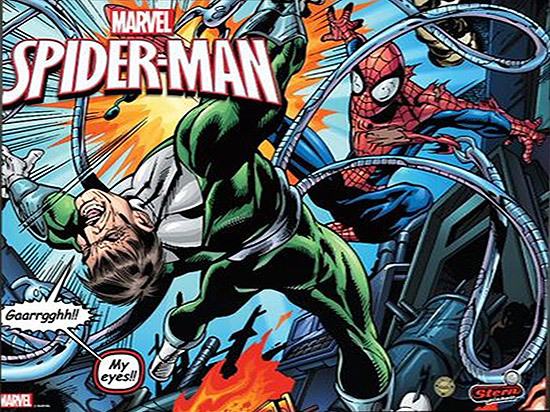 The series is a modernized re-imagining of Marvel's long-running Spider-Man comic book franchise as part of its Ultimate Marvel imprint. 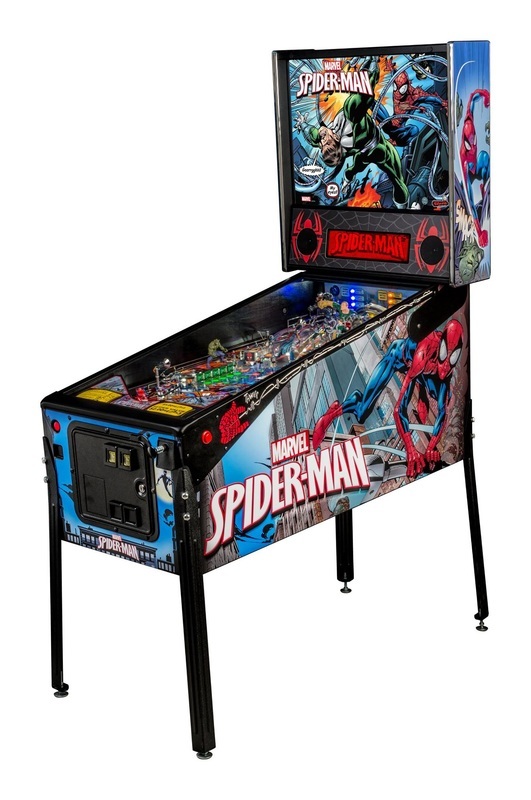 Spider-Man Vault Edition is available through authorized Stern Pinball distributors and dealers around the world and additional details are available upon request. 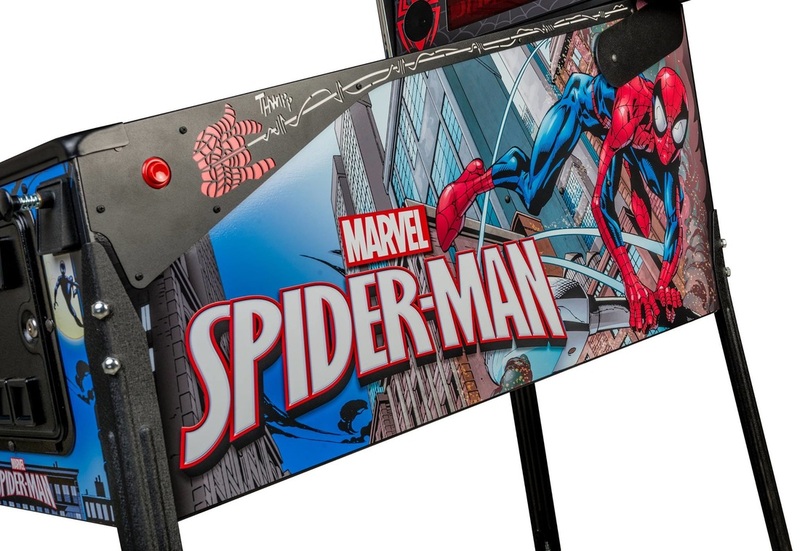 Above: Spider-Man model from 2007 playfield. 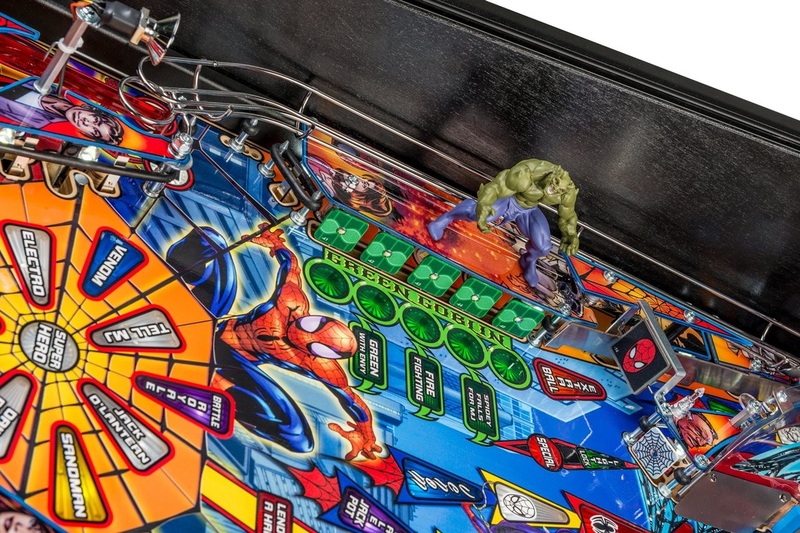 Left: Spider-Man Vault Edition (2016) playfield.